This was a difficult list to compile on account of the vast, vast, vast number of quality and iconic music venues in a city brimming with artistic flair and vibrancy. 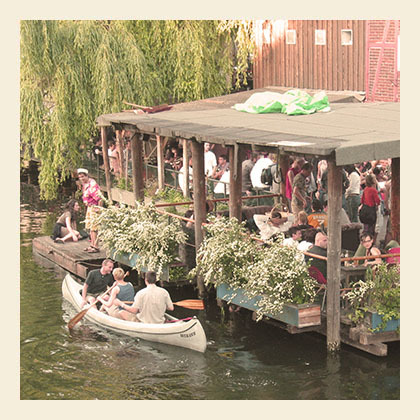 Nevertheless after scouring the streets, leaving no stone unturned, here is a round-up of Berlin’s top five music venues. Feel that we’ve missed something? Let us know, we appreciate your feedback. An obvious choice, but without doubt one of the most awe-inspiring clubs in the world, let alone in Berlin, and for good reason. Built just along the former East/West border in Friedrichshain, Berghain is the techno-lover’s Mecca. Every Friday the upstairs Panorama bar opens, housing some of the most prominent electronic artists from across the globe. The door policy can be notoriously picky, but if your vibe is open and your demeanour calm you shouldn’t have any problems. Oh, and no cameras – ever. The memory of your visit will have to suffice, and it just adds to the intrigue, doesn’t it? For those who like their party with a side-order of panoramic views of Berlin, the Weekend Club may well be the perfect location for you. Set on the 12th – 15th floor of a high-rise building in Alexanderplatz, and housing some of the most prominent DJs in the world, the Weekend Club is now three floors of prime party runway with LED displays, a gigantic open air terrace and breathtaking views of the city and beyond. One of West Berlin’s oldest and most renowned Jazz clubs, Quasimodo has all the dark and smoky charm of a Mississippi Delta Jazz bar and grill, attracting iconic artists like Roy Hargrove and homegrown talent like Jocelyn B Smith alike. Quasimodo really shine during Black History Month in February when act after act of renowned jazz talent play every evening. Also on the menu is soul, blues, latin and funk on various occasions throughout the year. Jazz fanatics and music fans in general will find a place in their hearts for Quasimodo. For the big acts, and I mean big acts (MJ and the Rolling Stones), Waldbühne is the perfectly whimsical woodland setting. The Waldbühne is a great open air stage, with an amphitheatre feel to it, in a gorgeous green belt near Olympiastadion. A much cosier venue in comparison to other Arena style settings, the acoustics and sound quality is legendary of Waldbühne. Also used as a classical venue and open air cinema in the summer months, the versatility of Waldbüne only adds to its charm. For regular updates on events, info, guides, tours and all other things Berlin visit the Oh-Berlin blog or visit their facebook page.